Willimantic Records: Monday, Nov. 5th: Willimantic Records will be open 5pm to 10pm tonight for in store show and shopping. Monday, Nov. 5th: Willimantic Records will be open 5pm to 10pm tonight for in store show and shopping. Dinosaur Jr.'s J. Mascis (drums/guitar/vocals), Cobra Verde's Tim Parnin (guitar) and John Petkovic (vocals/guitar), and Witch's Dave Sweetapple (bass/vocals) are Sweet Apple. Willimantic records still has copies of their limited edition "Elected"/"No Government" single for sale. They cover Alice Cooper on the A-side of the 7" and Anti Pasti on the flip. Since Sweet Apple haven't released a video to promote the record, up above is the Alice Cooper promo clip from 1972. A couple of used copies of Alice Cooper's LPs with "Elected" are also currently in stock. Sorry, the Anti Pasti sold already. A few long time Willimantic residents might remember seeing Petkovic's band Death of Samantha up the block at the Populous Pudding about a quater of a century ago, which is all the excuse I need to share a couple of their tunes. 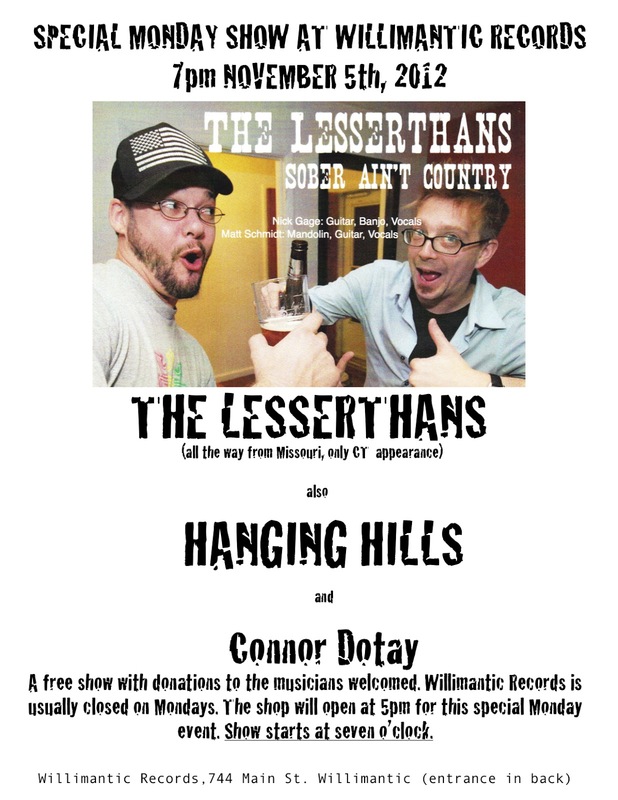 The Lesserthans, Hanging Hills, and Connor Dotay are playing in the shop tonight. Normally Willimantic Records is closed on Mondays, but we will be open 5pm to 10pm tonight for what should be a great show. Stop by, maybe pick up an election themed record, then try to forget about politics for a while and just enjoy some good live music.